In this age of so-called Big Data, organizations are scrambling to implement new software and hardware to increase the amount of data they collect and store. However, in doing so they are unwittingly making it harder to find the needles of useful information in the rapidly growing mounds of hay. If you don't know how to differentiate signals from noise, adding more noise only makes things worse. When we rely on data for making decisions, how do we tell what qualifies as a signal and what is merely noise? In and of itself, data is neither. Assuming that data is accurate, it is merely a collection of facts. When a fact is true and useful, only then is it a signal. When it's not, it's noise. It's that simple. 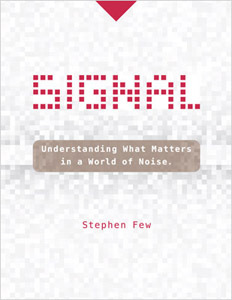 In Signal, Stephen Few provides the straightforward, practical instruction in everyday signal detection that has been lacking until now. Using data visualization methods, he teaches how to apply statistics to gain a comprehensive understanding of one's data and adapts the techniques of Statistical Process Control in new ways to detect not just changes in the metrics but also changes in the patterns that characterize data. Want a single copy? We recommend you buy it from Amazon, Barnes & Noble, or another fine bookseller.